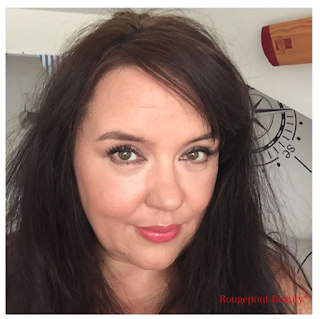 Rougepout Beauty: URBAN DECAY - causing trouble! URBAN DECAY - causing trouble! Urban Decay is causing trouble with a capital T, the new launch, available nationwide from 28th September is the Trouble Maker mascara. The packaging alone is a thing of beauty, a kaleidoscope of colour. When it comes to mascara I feel the same way as I do about fragrance, if you're going to wear it then make an impact. I love a mascara that adds to the lashes and gives them fullness and length, what's the point of subdued when lashes are there for fluttering. So, what trouble can this new launch from Urban Decay cause, well, here's the low down, lashes at the ready. TroubleMaker has a custom-made brush, the wand is designed to separate and comb through each lash with precision hooks, coating the lashes leaving them long and luscious. The creamy coating which smells of very expensive skincare is soft on the lashes, takes a firm hold and is going nowhere, well at least not with my lashes. It uses polymers to ensure the mascara adheres to the lashes, this prevents flaking, smudging and transfer. I love the grip of this mascara, it really pulls through the lashes, so, you get the separation and you can feel each individual lash getting a good coating. The length of lashes is noticeable from the first application, I also like the softness to the lashes, there is nothing worse than hard, brittle lashes. Apply two coats and the length is exaggerated and you see a fullness, ideal for day and evening. TroubleMaker mascara maybe scandalous in its grip on the lashes, for length and fullness it doesn't fail and lashes remain soft to the touch. Easy to remove with specific eye makeup remover or a good balm or oil cleanser, this is the mascara for anyone who loves trouble with a capital T for terrific trouble making lashes.